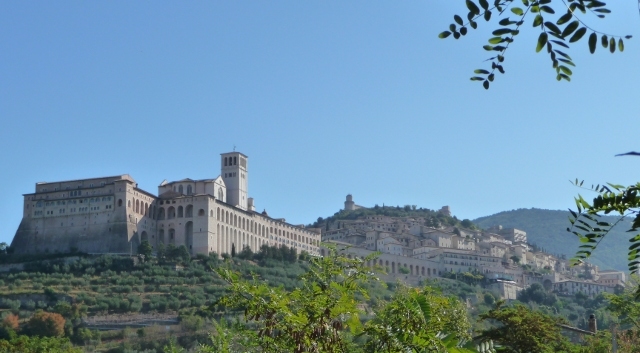 Assisi’s pale stone buildings in its setting along a hillside can be seen for miles around. Our campsite was around 5 km from the town and we took the walking route there. It felt fitting somehow to approach it on foot, a mini pilgrimage, among vines and olive groves – the town looming ever closer. Assisi is, of course, famous for Saint Francis, one of Italy’s patron saints and founder of the Franciscan order of monks. Born in 1182, his philosophy is simple and pure – he chose to give up material things and live in humble poverty staying as true as possible to what he felt was the essence of Christ’s teachings. Thus he also had an impact on the church of the time and its obvious wealth. This philosophy strikes a chord for many of us today in this materialistic world and many seek solace at Assisi, in Francis’s words and prayers. His contemporary, St Clare (Santa Chiara), also from Assisi, founded the female equivalent of the Franciscans, known as the Poor Clares. It is a touristy place of course, but thankfully this does’t detract too much from Saint Francis, whose presence is felt everywhere. Naturally many of the visitors are from religious orders and we were asked directions by a nun. We arrived in town on the eve of the great celebrations marking the feast of Saint Francis, so there were services in progress and many more people even than usual. Television cameras were being set up for live link ups to some of the religious events. The most prominent sight to see is the Basilica di San Francesco. It is made up of two large churches – one on top of the other, differing in age and featuring a treasure trove of frescoes by Giotto, Martini and Lorenzetti among others, though the Cimabue ones have suffered due to poor pigment and earthquakes. The ones in the airier upper church illustrate St Francis’s life. The older lower church, is dark and cavern like, mysterious with its lingering smell of incense, with incredible illustrations of the new testament scenes we’ve become so used to, and stairs lead down to Saint Francis’s tomb. We couldn’t help but wonder what the saint would have made of the 10 euro charge that so many were paying to have a mass said for them or a loved one. Or the fact that you could buy a votive candle, but instead of lighting it yourself, you left it in a pile to be lit by a church minion who replaced another only semi-burnt candle. Perhaps this was the only way to deal with the expected volume of candles being brought and to avoid a candle conflagration like the one we saw at Fatima in Portugal. As usual many tourists ignored the loudspeaker pleas for silence and to not take photos. We even saw one of them on his mobile phone near the altar … he was dressed in a habit though so maybe that was all right? There are a great number of sacred places at Assisi, and after visiting the Basilica, we strolled up through the town via a promotional fair of the province of Molise, with tastings of their produce from flavoured olive oils and truffle sauce to chocolate and biscuits – it made a lovely pre-lunch snack. After our actual lunch on the square, we proceeded to the Duomo with its beautiful exterior. Then it was 2.30pm and time for the church of St Chiara to reopen. A very feminine church in the pinky white local stone, we followed the crowds down to the crypt to see Santa Chiara herself. There are a lot of relics in town, not just the remains of the saints themselves, but their belongings, from habits to hairshirts. We also stumbled upon Saint Francis’s family home, showing the room in which he was supposed to have been imprisoned by his father. While in the Assisi area, we also visited the seventeenth century church of Santa Maria degli Angeli. Situated in the plain a couple of miles from Assisi, this church is built round a tiny chapel – the Porzuincola – which was the first Franciscan place of worship. The festivities meant the church and the tiny chapel itself were crowded with people. The chapel was a deeply spiritual place where you could feel the power of the prayers being said by so many all around you. The last sight we visited in Assisi, and perhaps the most evocative of Saint Francis’s teachings, was the sanctuary of San Damiano, where he had spent much time. A truly beautiful and humble setting, and original home to the Poor Clares. The life-like bronze statues placed here and there conjured his presence. This entry was posted in Art & Culture stuff, By Country - Italy, Personal stuff, Travel stuff. Bookmark the permalink. What a lovely account! 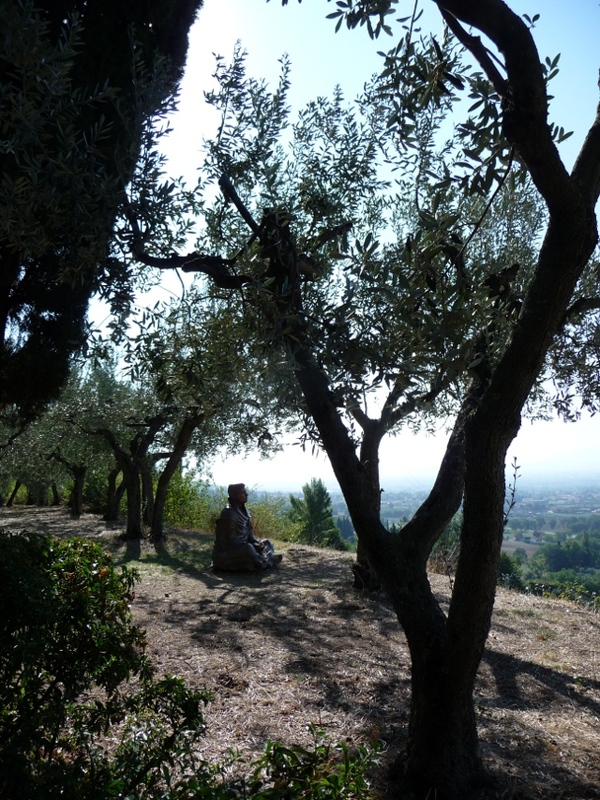 It’s a good many years (well pre-earthquake) since I drove to Assisi in one of my Dyanes and visited all those places you mention – and stayed in the monastery attached to the church on the plain. Huge numbers of pilgrims staying, vast vats of pasta, and of course lots of red wine – all for about tuppence a night!